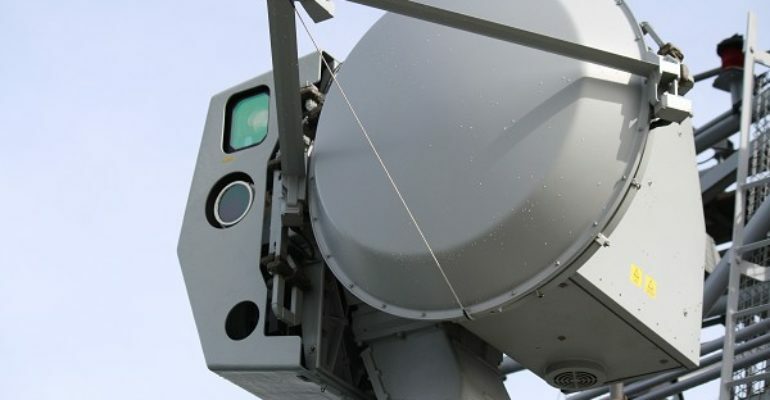 Saab’s CEROS (Celsius Tech Radar and Optronic Site) 200 is a ship-based search and tracking radar system capable of engaging targets above supersonic speeds. The CEROS employs a variety of sensors such as infrared, electrooptical, televisual, and laser. According to a publication by Saab, CEROS is able to detect sea-skimming missiles via its patented CHASE algorithm. [i] Saab explains that this algorithm mitigates the effect of multiparty wave interference, which is when signals are sent to a receiver by multiple sources. [ii] For example, a missile may emit a signal to a receiver, which then sends it to command and control at the same time that a signal directly from the missile reaches command and control. In this instant, the two signals would arrive with different phase shifts — think: a sine wave placed in front of another, so that there’s no exact overlap. This can result in the ghosting effect sometimes observed on television in which images appear to have a shadow duplicate on them. The CEROS 200 is a valuable fire control system that offers ships operating the system greater defensive capability against anti-ship warfare, particularly against sea skimming missiles. Utilizing the CHASE algorithm, the CEROS 200 is capable of processing the return signal from the missiles, which is usually a more difficult task due to the missiles’ proximity to the water. Ships operating the CEROS 200 would be able to nullify the multipath effect of the sea skimming to protect themselves.